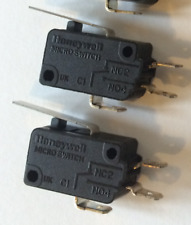 Miniature Microswitch 1SX1-T by Honeywell. Price is for ONE Microswitch. Our REF#259. Release Force 0.28N. New Honeywell 1CPSA2 (2NO/2NC) CABLE PULL SAFETY SWITCH MICRO SWITCH. Condition is New. Shipped with USPS Parcel Select Ground. 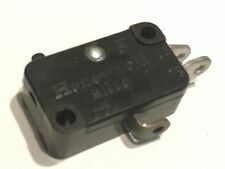 Honeywell Microswitch 2SE178. Sealed Switch. See photos for details about this part. Sale is for one (1) part and instruction sheet See photo(s) for details about this part. No other parts, hardware, instructions, etc. included in sale. 1x Honeywell Microswitch BZ-RW84X, 15A 125V, 250V, 480V Straight Lever, NOS! Honeywell Microswitch BZ-RW84X. Basic switch with Straight Lever. Sold as 1 per lot. Honeywell/Microswitch CMC Series Push Button. Up for sale is a NEW Honeywell LSA4L Micro Switch; 9531. Inventory # 133-J4-Y. New! HONEYWELL GSAB20C Micro Switch *Fast Shipping* Warranty! MPN: GSAB20C. • model # GSAB20C. 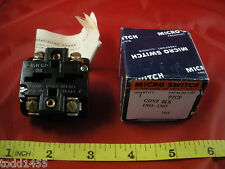 Honeywell Micro Switch. Call for better pricing! Condition: New. 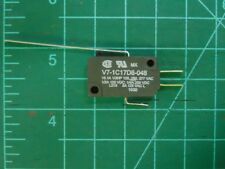 Microswitch Type : Subminiature. MICROSWITCH ROLLER SPDT 10.1A. Microswitch Actuator : Roller Lever. Actuation Type : Roller Lever. Actuator Type : Roller Lever. Switch Case : Nylon (Polyamide). AML Series 20. Illuminated Paddle Switch. Micro Switch. Lamp 28V Max. PTY2091 2ND PIC. RING SET 2ND PIC. PTYZ13 RED LENS LAST PIC. THE SET IS A PUSH PULL- 2 POS MAINT FULL VOLT UNLIGHTED MODEL B. Model: 4LS1. Plunger Style Head. Location X-48C. 8 am to 5 pm. Honeywell Microswitch 3PA3. these are NEW! Die Cast Zinc Enclosure for BZ Series basic switches. Honeywell Microswitch 9PA2 Operating Head w/o Actuator -- NEW! Honeywell Microswitch 9PA2. these are NEW! We also use used boxes when we can. 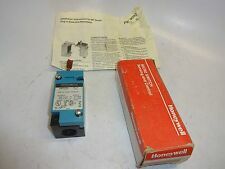 Honeywell Microswitch LSZ7P6B - Rotary Limit Switch - NEW! This is NEW! HDLS plug-in Side Rotary Global Limit Switch (lever not included).